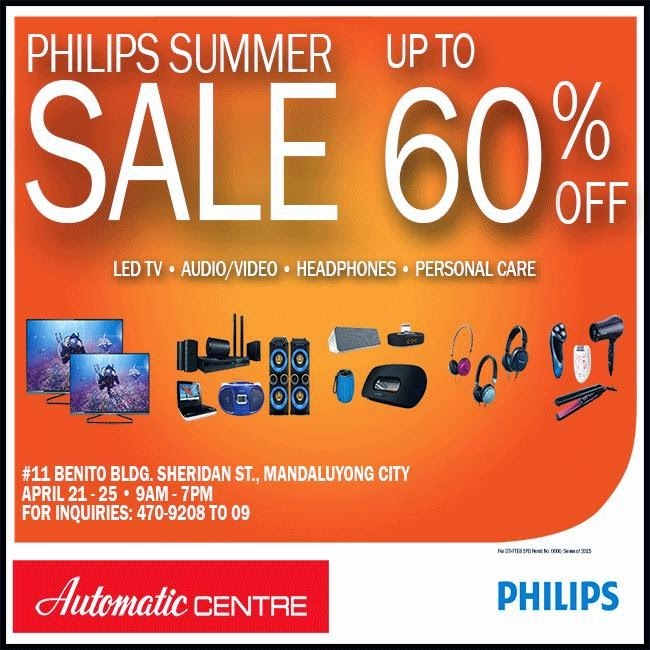 Automatic Centre: PHILIPS SUMMER SALE 2015! Mark your calendars on April 21 - 25, 2015 for the upcoming Philips Summer Sale only here at #11 Benito Bldg. Sheridan St., Mandaluyong City. Enjoy great discounts up to 60% OFF on selected LED TV's, Audio/Video, Headphones & Personal Care Products. For inquiries please call 470-9208 to 09. FOR MORE INFORMATION PLEASE CALL THE BRANCHES OR VISIT THE OFFICIAL SOCIAL MEDIA ACCOUNTS.